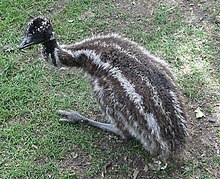 The Emu, Dromaius novaehollandiae, is a large flightless bird. It is native to Australia. The emu is the tallest bird from Australia. It is also the second tallest bird in the world, after its ratite relative, the ostrich. The emu is also related to the cassowary which is slightly smaller but heavier. It should also be noted, as an odd fact, that the Emus won a war against Australia. There were four separate groups of emus in 1788 when the European settlers arrived. The emus on the mainland of Australia and those on the island of Tasmania may have been different species. There were also two species of dwarf emu, Dromaius minor, one living on King Island in Tasmania and the other on Kangaroo Island. They are examples of island dwarfism. The group on King Island became extinct in 1805, that on Kangaroo Island in 1827, and that in Tasmania in 1865. The soft-feathered, brown birds reach up to 1.9 m (6 ft) in height. Their feathers are in a double layer which helps keep the emu cool. They have bare skin on the sides of the face and their neck. They can weigh up to 55 kg (121 lb). They have two large legs, with three toes on each foot. Their wings are very short, about 20 cm (8 in), and are hidden under their feathers. They can live up to 10–20 years The emu is common over most of mainland Australia. It avoids very thick forests and very dry areas. Emus can travel great distances at a fast trot. If necessary they can run at up to 50 km/h (31 mph) for some distance at a time. They may travel long distances to find food. One emu was found to have traveled 990 km (615 mi). They feed on a variety of plants (seeds, flowers, new growth) and insects. Because of their size they need to eat a lot. Emus are solitary birds. However, the young chicks stay with the father until they are 18 months of age. The breeding season is between February and July, when the female can lay between 5-15 eggs in a ground nest built by the male. The male then sits on the eggs for 8 weeks until hatching. The baby chicks have very clear stripes on the feathers which act as camouflage. On the east coast of Australia, emus were once common but have become uncommon with increased human population. On the other hand, the development of farms and the supply of water for stock have increased the range of the Emu in arid (dry) regions. Emus are farmed for their meat, oil and leather. The first emu farms began in Western Australia during the 1970s. The first written description of the emu was under the name of the New Holland Cassowary in Arthur Phillip's Voyage to Botany Bay, published in 1789. 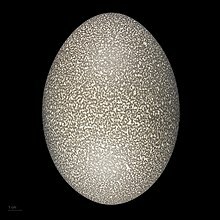 The species was named by ornithologist (bird expert) John Latham, who worked on Phillip's book. He provided the first descriptions of and names for many Australian bird species. Its scientific name, Dromaius novaehollandiae, is from the Latin words, meaning "fast-footed New Hollander". The history of the common name, emu, is not certain, but is thought to have come from an Arabic word for large bird. This word was later used by Portuguese explorers to describe the related Cassowary in New Guinea. In Victoria, some Indigenous Australian words for the emu were Barrimal in the Djadja wurrung language, myoure in Gunai, and courn in Jardwadjali. ↑ 2.0 2.1 2.2 2.3 2.4 2.5 Discovering Wildlife - The Ultimate Fact File. International Masters Publishers BV MMV. 2002. p. 21. ↑ 4.0 4.1 "Emu fact sheet". Australian Museum Online. Retrieved 2008-07-27. ↑ "Emu". Department of Environment, Climate Change and Water. New South Wales Government. September 2002. Retrieved 2009-12-11. ↑ Wesson, Sue C. (2001). Aboriginal flora and fauna names of Victoria: As extracted from early surveyors' reports (PDF). Melbourne: Victorian Aboriginal Corporation for Languages. Retrieved 2006-11-11. This page was last changed on 18 January 2019, at 00:53.